Well, in a week of disturbing revelations and utter chaos in Washington, here’s a silver lining at last. On the heels of the alarming news that President Donald Trump went off script last week in a meeting with the Russian foreign minister and ambassador and disclosed highly sensitive information to the Russian government, this is a welcome update that should put you at least temporarily at ease: According to new reports, Russian officials can’t seem to figure out which of the 50 things the president screamed at them about ISIS and airplanes yesterday was classified. Sources close to the Russian government admitted early this afternoon that, although they understood that Trump had divulged top-secret information, they had absolutely no idea how to parse through the deluge of airplane facts and ISIS intel he shouted at them during their 25-minute meeting. Although members of the Russian intelligence community have spent the last week frantically poring over the contents of the president’s wide-ranging tirade about ISIS, Boeing, potential terror attacks, potential terror attacks on planes, Air Force One, American espionage, and “very large and powerful jet engines,” they are said to be no closer to knowing what is and isn’t highly sensitive material. 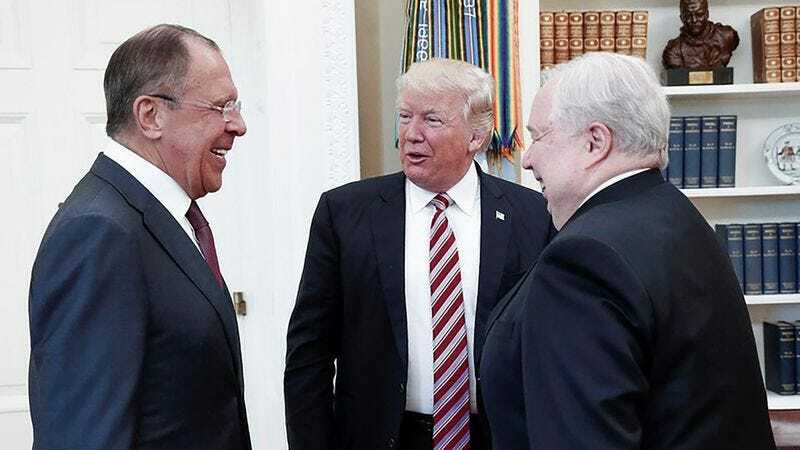 Accounts of the meeting indicate that Trump spent the bulk of their time alternating between screaming a list of all the types of airplanes he knew and detailing the specifics of impending ISIS terror plots, pausing at one point for a brief digression in which he intimated to Russian ambassador Sergey I. Kislyak that a “strong airplane so nice you wouldn’t believe” was under construction at an unspecified location in Eastern Europe. Yikes. This was definitely a close call. Whether the classified information Trump leaked was related to airplanes or ISIS, the White House has got to know this can’t happen again. Here’s hoping that the Russians never manage to sift through everything Trump said to find intel they can exploit and that the U.S. is able to avoid another diplomatic nightmare like this one in the future.